Don’t let the winter weather spoil your holiday. Call Absolute Home Solutions for a roof, window, and door replacement! As the holidays approach, so does the beginning of winter. With above average winter precipitation anticipated by the National Oceanic and Atmospheric Administration (NOAA), the east coast is expected to be colder and covered in snow for most of the winter. But the question is, is your home ready for winter weather? These storms can cause severe damage to your home, but with a roof, window, and door replacement from Absolute Home Solutions, you won’t need to worry about a thing! 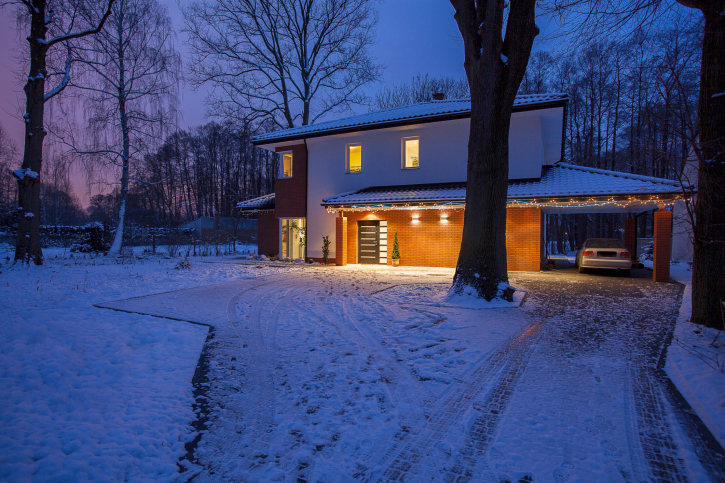 The roof of your home doesn’t only keep the snow from raining down on your head, it also keeps the warm air in your home. But with an older roof, your home may not be as warm and dry as it could be. Leaks can lead to major water damage in the attic as well as the top floor of your home leading to costly repairs. Unfortunately, leaky roofs can be difficult to repair during the winter weather because of the materials used as well as the ice and snow on your roof. These limitations mean your attic will continue to be damaged until spring when our roofing specialists can fix your roof. If you suspect your home needs a roof replacement, don’t wait until winter weather comes into your home, let Absolute Home Solutions take care of your leaks now! We constantly run the heat to keep our homes nice and toasty during the cold winter nights. These nights of constant heat can drive your energy bills through your newly repaired roof. But with new windows and doors, your home’s energy bills will be cut in half. Old windows and doors allow cold air to drift into your home creating a draft. But when your home’s heating system is on an automatic setting, this can cause your heat to run constantly. When a door and window replacement, your heating unit will only run when absolutely necessary to keep your home warm. These replacement options can also offer to pay you with a tax break on Energy Star products. Replacing your home’s elements will not only improve your energy costs but it will also help to improve the look of your home just in time for the holiday season! Don’t let winter weather ruin your season! Call Absolute Home Solutions today for a roof, window, and door replacement today! If you are ready for a roof, window, or door replacement for your home or just want more information, contact Absolute Home Solutions at 240-328-9872 for a free consultation. You can also connect with Absolute Home Solutions on Facebook, Google+, Pinterest and Twitter. We proudly serve Chevy Chase, Bethesda, Potomac, Silver Spring, Gaithersburg, Rockville, Ellicott City, Howard County, Montgomery County, Northern Virginia Sterling, Ashburn, Herndon, Great Falls, Potomac Falls, McLean, Falls Church, Alexandria, and Washington D.C. This entry was posted on Monday, November 16th, 2015	at 10:34 pm	and is filed under Blog . You can follow any responses to this entry through the RSS 2.0 feed. You can leave a response, or trackback from your own site.